The hosts of Cartridge Based Radio, Donald and Brad, break down old video games and try to tease out what was going on behind the scenes in the story world of the game to make it happen. We got to tackle the legendary game Shaq Fu. Everyone hates this game, and while I acknowledge it's terrible for many reasons, my brothers and I actually had a lot of fun playing it when we were in grade school. Listen to the episode to hear me explain how this terrible game can actually be really fun. It's really funny and you get to learn a little about the game, but also hear the two host's theories on what brought about the world that the characters in the game live in. Every episode I've listened to has made me laugh and this one where I got to be a guest was no exception. It was a blast to be on the show. Go to their website, or your favorite podcatcher, and give it a listen. I'm sure you'll be hitting the subscribe button before you can say Shaq. The Robot Uprising has Started... Editing my Novel! 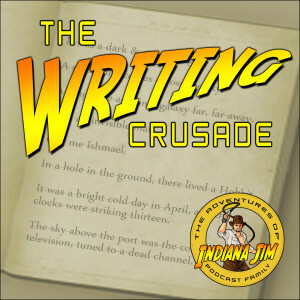 I'm a Co-Host on The Writing Crusade w/ Indian Jim! Remember that cryptic post I published a while back called "Exciting News?" It's here! 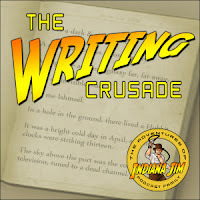 I got to go onto Indiana Jim's writing podcast, called The Writing Crusade, as his co-host! We talked a lot about writing, how to do it better, more often, and lots of other great stuff. Go check it out. I had a great time coming on the show and I look forward to recording many more episodes with him. I've been a big fan of his podcasts and it's really cool to be a part of it now!